Hors Catégorie Brewing: What is Grisette? What is Grisette? What does it mean to me? Is that an accurate meaning? What else could it mean? 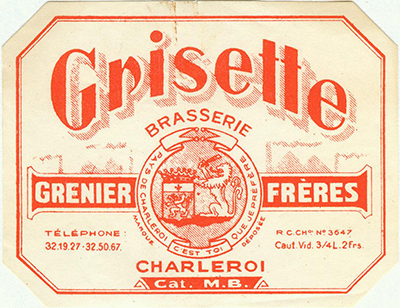 While Saisons are (historically) beers rooted in the farm, Grisettes are beers inherently rooted in industry and the industrial revolution. They were brewed for miners in the Hainaut province (and possibly adjacent mining areas) in south of Belgium, which until the World Wars was one of the centers of the Industrial Revolution in Europe (see this wikipedia page and the cities mentioned within). The Hainaut province is the same region that saisons come from, and there were likely significant similarities between the two beers. Both mining and farming are rural activities done on (or in) the land with the need for an urban area nearby to sell/process goods and for trading. And in addition both the styles are beers to refresh the workers and, as such, would have been lower strength and would have fulfilled the same basic requirements. As the world industrialized as a whole, so did breweries. And this would have influenced beers (which influences grisettes as well as saisons). This means larger breweries with better/more specialized equipment and more desire for consistency. And more specific roles and trained people to work those roles rather than brewing being a part time task in the off season. For beer, and especially grisette as it would have been more central in industrialization than saison, this would mean beers trending toward cleaner fermentation and the regular use of certain ingredients rather than more variable recipes. It also might mean that with brewing more as an occupation and less as a role secondary to another occupation such as farming, the amount of time given to each beer for fermentation and conditioning would start to come down, resulting in 'cleaner' beer (by this I mean less influence of slower growing wild yeasts and bacteria and not a reflection on Saccharomyces yeast character, which is often developed and complex for strains common in saison) whether or not 'cleaner' pitches of yeast were used for fermentation. And beers being sold sooner would also lead to brewers wanting to produce beers that were ready to be released sooner. Malting practices were becoming better at the same time, meaning more consistent and also likely paler malts were available. Consumer taste preferences were starting to shift as beers traveled further and imported beers came in. All of this combines to yield a very dynamic landscape for beer. And as writers of the time still for the most part didn't care about smaller styles of beer being brewed in these rural (though sometimes not so rural) areas of Belgium, there isn't a lot of sound documentation on what was going on. 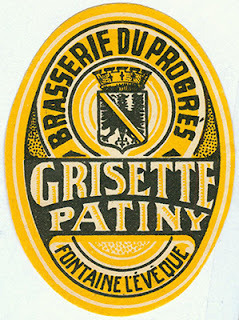 Old beer labels can also give some insight on grisette. A possible concern about basing this analysis partly on old labels is that I won't really be able to disambiguate marketing speak from truthful information about the beers. Another concern is that I am drawing only from the breweries that are large enough or sufficiently well known to have records of their labels. But given that grisette is by its nature tied to industrialization I am ok with that concern (it may be more of a problem for historic saison studies). 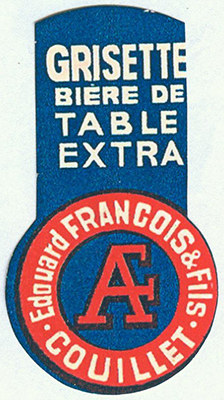 Jacques Trifin's website is an awesome resource of old Belgian beer labels and all of the labels I'm showing here come from this site. Taking the labels with the above precautions in mind, the old labels for grisette that give a strength indication list 2nd Catégorie or 3rd Catégorie. This category system likely has tax class roots, but it also gives us an idea of the strength range of the beer (see this link from the Netherlands, article 4, also this wikipedia page). According to the modern Dutch categories, a Cat. 2 beer has an OG of 7-11 P (1.028-1.046) and a Cat. 3 beer has an OG of 1-7 P (1.004-1.028). The specific gravity ranges of such a system have likely changed over time and country to country, but presuming that the categories haven't completely changed, category 2 and category 3 beers would be lower strength than what we would now consider normal strength beer (Cat. 1). Of all the numbered strength categories I saw, there were 3, 2, and 1 corresponding to beers I would expect to be increasing in strength in that order, so that gives us some confidence that the 1900's Belgium system is somewhat similar to the modern Dutch one. If someone knows what specific strength ranges these old Belgian categories meant that would give us a more definite answer, but I suspect it won't be extremely different from the ranges here. 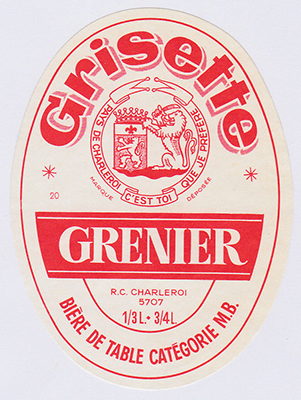 There is one label for a beer termed "Grisette double" (see here, note that this brewery closed in 1923, early compared to the other labels here) but mostly when I'm seeing a strength modifier it is 2nd category (see below left), something like table beer/house beer (here as well as Francois and sons above left and Grenier top of the page right) or 3rd category versions (here and here, the same shown below center and right). Synthesizing this, the bulk of the information seems to be pointing toward a low strength, pale, hoppy wheat beer that would not have been aged especially long, though some versions may have been a bit stronger and aged a bit longer. But it seems that most of the grisettes that we have records of now were lower strength beers. Moving ahead with this, from something in the range of category 2-3, the 3-5% abv sounds about right, with grisettes perhaps more likely falling on the lower end of that range later in their history (category 3 would be on the lower end of that range, or quite easily below it, given the modern Dutch OGs associated with these categories). Unfortunately the labels don't offer any specific recipe info, but we can be reasonably sure that (at least at one point) wheat was a fundamental part of the beers given the info from Brewing with Wheat. Many of the breweries that the labels came from were brewing a number of different beers (saison, pils, bock, brune, abbey beers...) so it seems that in the 1900's at least they were confident working with different yeasts in the same brewery. Along with the general identity of grisette being tied to industrialization, this lends support the grisettes being more of a pure culture fermentation than historic saisons. Because the grisette labels have no indication of being an aged beer, while some other labels of the time do include a note for aged beers (and since it would add cost to a brewery to keep a beer around longer you'd think they would want to advertise it), we can also assume that grisettes were generally served younger. This would mean that the hop character would be more forward than an aged beer of a similar recipe and there would not be much time for bacteria (and in addition wild yeast) development, lending support to the Farmhouse Ales information that grisettes were crisp from hop character and without acidity. 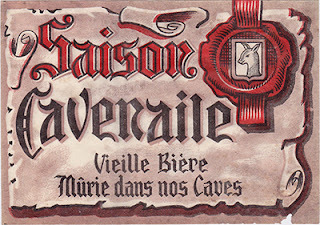 Saison Cavenaile - "matured in out cellars"
This gives us a good ballpark for the sort of beer that a grisette was. I think it is reasonable to think of grisette as a lost branch in the saison family fitting somewhere between historic farmhouse saison and modern saison. Many modern saisons are also more clean (using only Saccharomyces). 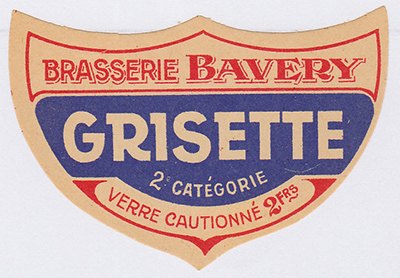 Modern saison gravities are higher than historic saison, and given the gravity category on saison labels from around the time of grisettes, saison gravities were also higher than those of grisettes. Based on descriptions of "Vieille" or "mûrie dans nos caves" (matured in our cellars) on saison labels, saisons of the time were still beers with more age. With imperfect yeast management this would still allow for the expression of wild yeast and bacteria character, though at the time saisons were also moving toward being pure culture products. 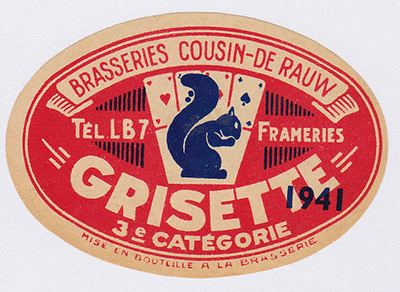 In looking at the modern day petite saisons, some of these may have considerable overlap with grisettes. I think a microbially clean (or at least mostly clean) but expressively fermented, shorter-aged, low strength beer with wheat and a more prominent hop profile could definitely be a description of either a grisette or a modern petite saison. To me petite saison is more open to the possibility of lactic acid and/or brettanomyces character, but that may be one of multiple sides of petite saison. So although I don't think the two are interchangeable, I think there are beers out there that could be appropriately described by either term. It would be interesting to get a bit more information on Grisette de Saison as I didn't find anything with that name or mentioning longer aging for grisette in the label collection. That could be something more in line with saisons given the higher gravity and longer aging that Markowski mentions. I'd also like to find out some more info on earlier grisettes. So still some questions remaining. I'll update this post as I find more answers (or if there is enough new stuff then I'll do a follow up post). Ok, so there's some thoughts on grisette. Here's a recipe for a beer that I was calling a Grisette, at least at the time I brewed it. Apr 2016 Update: I will be presenting this and continued research on grisette at the 2016 AHA National Homebrewers Conference. Hope to see you there if you are headed to the conference! If not, I am hoping to post a follow with my ongoing research sometimes shortly after the conference. I've been struggling with this myself as I've been making what I've called a saison but have felt because of it's cleaner attributes and being brewed in a town known for its granite mining community (Barre VT) that I should really call it a Grisette. And oddly enough I'm about to tweak the recipe to have 8-10% wheat. But, living in Vermont, I'm particularly sensitive to this notion of using style terms that don't align with the historical spirit of the style--so "farmhouse ales" and saisons get used in a way that to me is about marketing. In fact, Vermont brewery Long Trail is particularly guilty of this with their farmhouse ale series. So many thanks for reaffirming my inclinations and giving confidence to telling friends that it's a Grisette (and now I have some more info to have good conversation about what that actually is as a style of beer). Thanks Jake! I totally agree with you about the marketing thing and in writing up this post I ended up cutting a paragraph or two sort of ranting on that topic (I alluded to this with the semantics discussion comment). I do feel a bit funny calling my beers saisons at times. And, as i mentioned at the top, it was some breweries around me doing this sort of thing that prompted me to go down the trail that led to this post. So I know completely where you are coming from. Excellent, glad this helps you out! Looking forward to your update with some recipes. 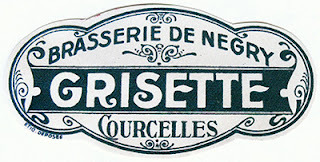 Reading this, I think Grisette is more what I had in mind when I first read about Saison's. Interesting and keen to try and brew one. Thanks Stefan! Yeah, it does combine some aspects you read about with saison (low strength to be refreshing and consumable in volume while doing field work) with what is represented by some of the better known modern versions (crisp hop character and no acidity). I'll try to get my recipe up shortly. I'm working on tracking down more Grisette info and have found some that adds nicely to this story, so "What is Grisette part 2" is probably in the works, but I suspect it will be some time. When I had my first Grisette a few months ago, I was skeptical. It looked, smelled, and tasted exactly like a Saison. I did a very small amount of research afterwards and came to the conclusion that modern Grisettes are merely a marketing trick to differentiate one Saison from the sea of other Saisons. I agree that in modern times the term Grisette is used basically as a synonym for any sort of lower strength saison (though the definition of lower strength is pretty loose here), regardless of hoppyness, barrel aging, funk, acidity, fruit/spice additions, etc. So you're totally right, the modern ones seem to frequently be a lot of marketing of 'try this new reincarnation of a lost beer style'. And that was a bit of a bummer to me, and it inspired me to do the research for this post. 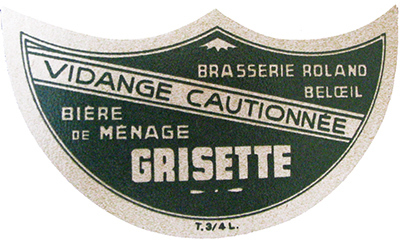 There definitely seems to be a historical difference between grisettes and saisons made at the same breweries at the same time in the 1900s. Dave, a question about one more thing that I gleaned from Farmhouse Ales. I seem to remember that Markowski made a comment that a Grisette being made with a more common Belgian yeast than a Saison yeast. His recipe calls for WLP550. Did you come across anything indicating this? So to be a Grisette would essentially be an industrialized, small saison (same grist & hopping schedule). This goes along with the argument you make in the article, but I wondered if you would agree. Your recipe would counter this. Hi Mike, that's a good question. Thanks for asking! Up to this point I haven't found anything in the way specifics for yeast. Unfortunately a lot of the stuff is snippets here and there (the same is true with historic saison info) and it doesn't deal much with technical details in general. I've found multiple sources say that grisette brewers kept their recipe/process a closely guarded secret and that the authors didn't know much about how to make the beer. Unfortunately I don't have my copies of FA or Brewing with Wheat around (both are in Germany and I'll be re-united with them in about a week) so I can't look through those for what they say. I do think I remember an account in FA that describes them as saison-like. 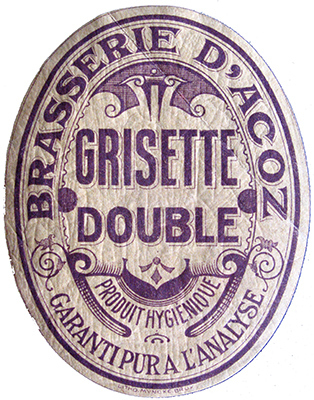 There was overlap with breweries producing both grisettes and saisons. Some of these breweries also made lagers and other ales that we now associate with cleaner yeasts so it is hard to say how many yeasts they kept around and what those were like. With a lower strength beer the yeast will generally be more muted anyway so I suspect a saison-type yeast is at least not out of place. I can't give any firm answer here but from what I remember from FA I'd lean toward something saison-like in yeast as well. I think there would be a major potential difference in aging between the two beers and therefore expression of other yeasts, so in that way as well I would expect grisette to be a more muted fermentation-wise than saison. Thanks and I'll come back and update if I find more about yeast. Regarding the "Grisette double" label. The label says "Produit Hygienique". I translate that to "hygienic product". Is this commonly found on labels from that time? Are the brewery referring to the techniques used to produce the beer? Hi Olof, thanks for the question. It is not uncommon for labels of the time to have a couple words mentioning the purity of the beer or other good qualities like this, but I wouldn't say that Produit Hygienique specifically shows up that much from what I've seen. I don't have any specifics as to what this means, but my guess is that it is generally referring to the beer being good/wholesome and pure. Similar to how one might see words like natural or healthy on labels and how sometimes these words are used in meaningless ways (at least in the US). That specific brewery closed in 1923 so I suspect it does not refer to fermentation (I think they were not using a pure culture for fermentation). Maybe they thought they were, but I've seen notes from British brewing scientists from 1918 where one of the group mentions that he doesn't think it is possible for an ale brewery to have a pure culture. Yeah fair enough. Great posts about Grisettes by the way! My main concern here is whether or not the beer would become tart with age as the hop profile diminished & if this practice would produce any negative results. Do you know of anybody intentionally adding lacto before packaging, or of any other experiments like this? Thanks Kyle, good question! Yeah, I agree that historically a grisette would show expression of a mixed culture if it were aged for a while. This was generally not the case in historical grisette (it wouldn't usually be aged enough for this to show) but in general all top fermentation beers of this time would have been mixed culture, so if they were aged then this would show up. This is discussed a bit in this thread from the Saison group: https://www.facebook.com/groups/1517563441866109/permalink/1758306704458447/?comment_id=1758491657773285&comment_tracking=%7B%22tn%22%3A%22R2%22%7D, where I quote the article discussed (for other reasons) in this blog post: http://www.horscategoriebrewing.com/2016/02/thoughts-on-johnson-1918-belgian.html. 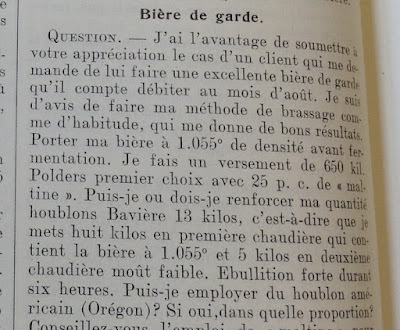 Garrett also quotes a cool passage from Farmhouse Ales that pulls from an article from 1920 in Le Petit Journal du Brasseur. Anyway, the mixed culture thing is more an attribute of early 1900 (and before) ales than it is grisette specifically. Yeah, if the beer went from 1.002 to 1.000 then you'd get that extra volume of CO2. That isn't necessarily guaranteed, just as it isn't guaranteed that it wouldn't go further than that. But there is more margin for error if you are already at 1.002. That plan sounds good for an interesting beer overall. Probably not that much different from a mixed primary in a hoppy beer. I don't have any specific info on dosing lacto pre-bottling. But there are beers bottled before the lacto has made much impact but which can develop a bit of acidity with time. I've done homebrews this way, and I think the best commercial examples are some of what Jester King is doing. Their mixed culture saisons that are released fairly young (like Petit Prince) are great and are different beers when aged. I think if this is your goal I would just do a mixed primary and bottle young-ish, but that's just what would do. There is definitely the possibility that it wouldn't express a lot of acidity so choose the a more aggressive/hop tolerant lacto if this is what you are going for. Overall with something along the lines of a historic grisette I generally wouldn't expect a forward acidity within 6 months (if at all) so if you're looking for sour then this might not be the beer. But if you're looking to see what mixed culture will do when given time in a wort with moderate hopping and higher attenuation then this sounds like a nice trial that you have planned. Thanks for the information. I've been scouring the web for quite sometime with little to no results. Lol. Definitely not looking for sour... More along the lines of ”bright". It would be awesome to have the noble hops slowly fade into a tart, Brett forward ale. Cool, in that case I think many historic beers would fit this sort of description and I think you can get what you want with the right strains/dregs by either co-pitching in primary or dosing at bottling.